If you are thinking about this "How to Write Most Useful Articles for Your Blog Readers" then you must know articles are most important part of blogging like blood for human body, if you are newbie to blogging world then probably you don't know this thing, some people says this Content is King in blogging, even I believe too in these two words, actually blogging is getting more popularity day by day even it will be more ahead, what I believe? NOTE- Writing from experience and through research is the way to get success in blogging even it will work forever. See, I don't know about you, but I do know you need to improve your writing skills otherwise your whole work will be dump, may be today or tomorrow, I mean to say solve problems in this way that your competitor need to think 5 times to beat you. May be you know blogging is solving people problem may be directly or indirectly, like I am blogging for helping people to start blogging and make money from it but you may start a blog for writing a series of story may be video series its on you but all things can become popular but need dedicated work. Let's take an example for this, if you want to beat Wikipedia then it is foolish thinking for you right? Because, it is really difficult to beat Wikipedia, yes one thing you can use to beat any website or blog, i.e. use long tail Keywords. Like, if you will search about "Search Engine Optimization", then most probably you are going to get results, but on the top would be Wikipedia. So, I will suggest you don't write an article with title name of the article "Search Engine Optimization", but do write articles on SEO with different keywords, what people are searching on the web on the same topic like here "SEO". Now come to the main part of this blog post, I am going to share with you the most important activity of blogging, I know SEO is really helpful to take your blog to the next level but most important is your content. Probably you have seen many design bloggers succeed in blogging quiet easily, you know why? They are going lot of experiments daily and what they got from the experiment they share with you for free but they do get back link for the gadget or template they are providing for free to others or most probably for bloggers. From this fact, we got only two important thing, one of them is experiments and another one is sharing. So, no matter on which niche you are blogging, but don't forget to do experiments and then share results with your blog readers. I have just share those payment stories with my readers and I am driving more than 100 visitors per day alone from those blog articles. Hopefully you are getting me, what I am talking about? Experiments A/B Test- A/B test means, test your readers, sources on different ways to find out the best way, you may take as an example of sending e-mail news letter to blog readers, write two type of e-mail news letters for sending to readers for same blog post then send first one to half of your blog readers and send another one to another half of your blog readers and find out which one works better, in this way you can do test for finding out the best. Take Surveys- I can remember an incident, actually in that time I was studying Engineering, one day I went to market for shopping there were a MBA student taking survey for their shopping complex that student ask me to fill the form, which is only about their shopping complex, I filled that form and ask him why you people are requesting us to fill the form, he said to me only one sentence, do you want to know? what is that? He said to me "That's why you will keep coming here for shopping" That day I understood how taking survey is powerful? Now for you- you must take survey from your blog readers it will definitely helpful for you. Talk to Friends- Experiments help us to grow, find out better option or may be to discover something new. If you will talk to friends then I am sure you will definitely find out better option. But don't ask any one who is not familiar with your blog, otherwise you will just waste your time nothing else. Be Useful for Others- Not only experimenting is the way to discover best thing, readers also helpful too, but for this you need to write great content for getting quality readers. #2)- Read What Others Are Saying? When, I have started blogging, I did not know anything even I don't know, how to create a blog post? But, today I have two popular blogs like www.governmentjobsgate.com (Higher Education Blog and Beyond) and this blog. Still, I am learning many things and I am sharing with you, still I think, I am a beginner, because every day I found something new in blogging. And new things, I got from other blogs and experiments, actually I have listed more than 100 blogs to read in a week and I have also create Google alerts to keep up to date myself with my interested topics. I will suggest you to read other blogs, get inspire but do one thing do not follow any one, just create your own path to travel and learn from each and every step your are going in blogging and what next? Share dear about the step with your readers! Complete Today Work- Don't think too much just keep doing what sources you have to complete your present task that's why you will live in present. Exercise Daily Before and After Work- This is my favorite, even after exercising daily you will feel much better eve after doing hard work. Go for Journey- Long journey may be turning point for you, because it always teach use new things, if you can implement what you learn then it will be much better. Talk to Stranger in Train- See, I am from India and in India Long Journey by Train is just amazing (Cheap and Comfortable two in one), I usually do long journey every 3 months and usually talk to strangers sometimes with similar ages, sometimes debate with elders and all that. But at the end I learn something and most important I come to know about my capability to make people understand what I think? Leverage Sources- No matter what are sources you have right now? You need to expand, actually I have learn this technique from a Hollywood Movie, may be you have heard or watch I don't know its "The Social Network" which is based on Facebook "an amazing social network", well in blogging you need to leverage your traffic sources like don't depend on only Organic traffic means search engine traffic rather try to use social media, e-mail marketing too for getting traffic from other sources. This is amazing, even I do before writing a blog posts, actually this activity will tell you, what people are thinking about this topic even what people are sharing with people and what not? That means, If you will find an article then read the article before going to write the article, if you found many articles then read all of them. See, I know, may be you are thinking this much effort you have to give to write an article, yes my dear you have to, otherwise you are not going to get real sauce of blogging, I mean think about this, internet is the biggest market in the world then definitely you will have to do hard work to get inside the market, I mean to say, to attract more readers or customers to your blog. One more thing, I would like to share with you, these activity will turn you to write an useful article, which will be useful for beginners as well as expert. Always write an article from beginning like newspaper style or may be Wikipedia style. See search engine optimization is a single way to reach to your audience then what about others? Like email marketing, social medias. I think, blogger must concentrate on these two too, to attract more traffic to your blog. One another good free way to get unbelievable traffic to your blog, that is StumpleUpon, don't forget to submit your blog to StumbleUpon to get more traffic to your blog. Advertisements- For getting traffic instantly "any number" to any website then this is the only way, but it cost. So, always see your budget and then go for this method but one more lesson I would like to share with you, always see result after setting small budget if it works then go for "Roll Out Method" means go for big one. Writing Great Content- Great content is the key for online success because people having lot of option to use, write detail content with video, images then it would be much better and it will be competence. Organic Traffic- Its not a one day job like one day study can not help you to become topper because it needs practice like the same here you need to keep writing very good quality content and should be optimize for search engines. Social Media- Its like new organic traffic source, but you need to do practice to find out the best source as well as best way to drive more traffic to your blog. Direct Contacts- Mouth to mouth contact convert much better, faster, effective than virtually recommended things, then why not tell your friends about your blog and your success story. E-mail Marketing- Collect e-mails of your blog readers that's why they will be your readers for forever, use can use free e-mail marketing service of feedburner. Give a chance to your blog readers to engage with your blog post, ask them questions, it will also increase comments in your blog post, comments also help to get good rank on search engine. One more thing, at the last to satisfy your blog readers, don't forget to write key points of the blog post, it will help your blog readers to recall, what they got from the blog post? See blogging is really make money but it takes time, you can see that day soon, if you will concentrate on these five points, see only knowing things is not good enough to get result, see if you want to succeed, then you have to implement these points. 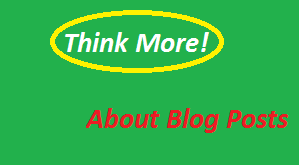 Do you know, any other way to write better article for your blog readers?